» What is the active oxygen in the refrigerator and washing machine? What is the active oxygen in the refrigerator and washing machine? Manufacturers of home appliances, home appliances produced with Active oxygen function, with the use of active oxygen. In refrigerators thereby extended shelf life of products. Washing machine can wash at a low temperature in the absence of water and detergent. The advertisement states that produces active oxygen which conducts disinfection, etc. In fact, in some household appliances ozone generator is installed by passing an electrical charge through the air, electric shock knocks out one atom of oxygen molecules, which is attached to a normal molecule generated ozone, and ozone is a molecule of oxygen with three atoms instead of two. 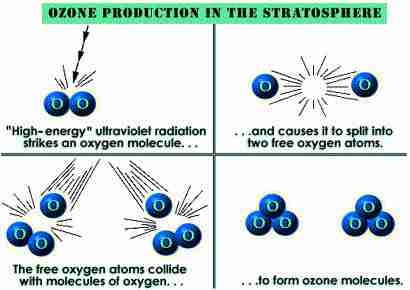 Ozone is a strong oxidant of organic compounds, it is unstable and decomposes rapidly at room temperature for nekolko minutes giving extra atom that reacts with other compounds, especially organic matter, the atom, the molecule breaks down organic matter. Therefore, there is a refrigerator in killing bacteria, in washing machines and clothes entering the oxidation process occurs, and as the main pollutants and organic compounds clothing is their decomposition. Full Active oxygen cycle of operation can be shown in the picture. Due to this and achieved the stated function of household appliances. 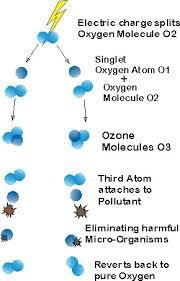 And why active oxygen, so a beautiful name and in the process basically really involved oxygen. It should be noted that the use of ozone (oxygen) is used for a long time, you can create an oxidizer and by chemical reactions, are widely used such technology in detergents to enhance the effect on the clothes clean during washing. Recently, ozone also been used for disinfection of medical, particularly intensively conducted studies in dentistry direction.